I started this last night after having a real hankering to poach pears, as well to retry the French tart dough recipe by David Lebovitz. 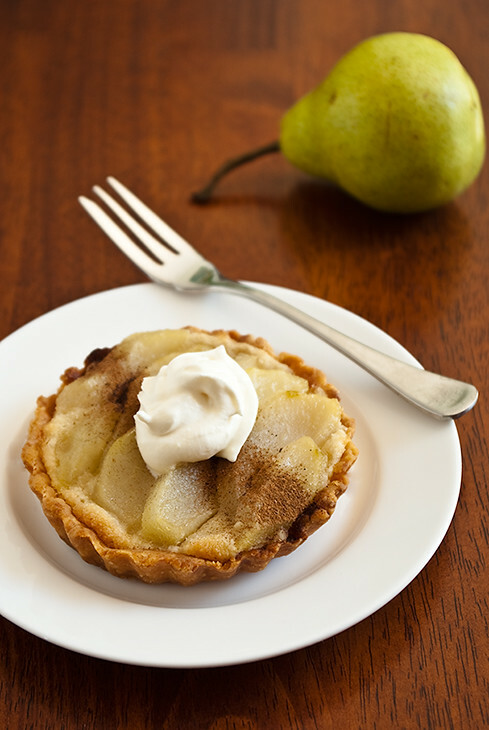 I only managed to poach the pears last night, and worked on the tart crust before breakfast this morning. The tart crust works very well, but it's unfortunately not the prettiest thing in the world. Luckily, taste trumps looks any day. I'm a big fan of pears, which is funny because in the past I would never eat them. Recently I've been wanting to bake pears into everything. There's something wonderful about baked pears that, for me, apples lack. So I headed out, bought some almond meal, and began my adventure. This tart isn't the prettiest in the world, I mostly put it down to my lack of experience so maybe someone else can do better? It's not really a worry though because it still tastes rather good! 1 quantity French Tart Dough divided into six 10cm (4") tart tins. 3 Packham pears, peeled, halved, and cored. Place water and sugar in a large saucepan over a low-medium heat and stir until sugar has dissolved. Once dissolved simmer for 5 minutes. Start peeling your pears now, if you haven't already done so. Add pears and simmer for 10 minutes, or until tender. Gently stir in the rose water and simmer for another 5 minutes. Remove pears and cool on paper towel. Cream butter and sugar in a large bowl until light and fluffy. Beat in egg and vanilla essence until thoroughly combined. Fold in almond meal, flour, and water. Spoon almond mixture into pre baked tart crusts, slice pears thinly and lay them over the almond mixture, you should have enough pears to cover all six tarts. If you have any extra, slice the remaining pieces even smaller and use them to fill any gaps. The almond mixture should be fairly well covered. Bake tarts for 15-20 minutes or until almond mixture is a faint golden colour. Serve at room temperature with cinnamon and whipped cream. I was wondering what I should do with the tart shells in my freezer ... now I know. Also, I love the way you photograph food.